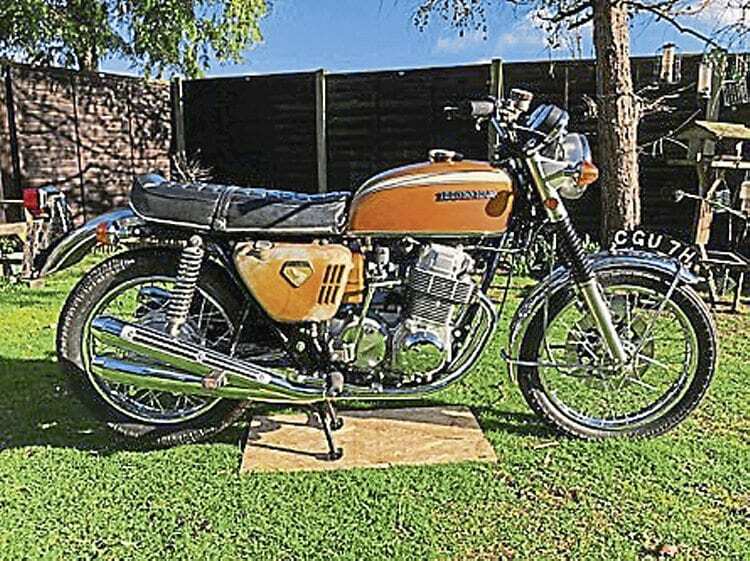 A pre-production Honda CB750 four, one of only two survivors from the four originally largely handmade in Japan around 1968, was due to come up for sale at the H&H Classics sale at the National Motorcycle Museum on March 4. This particular machine, bearing frame no CB750-2110, reached Britain in 1969 and after being registered by Honda UK was used in the launch of the production CB750 model. It was being restored when its owner, who’d had it in his private collection for the past 35 years, sadly passed away. CGU 7H is the ordinary UK number plate on this historically important machine – one of only two remaining late pre-production Honda CB750s. The gold bike’s first European appearance came at the Brighton Motorcycle Show from April 5-12, 1969, and it also appeared on the cover of Motorcycle Mechanics in May 1969. Although Honda hadn’t even discussed the idea of a four-cylinder seven-fifty until June 1968 (spurred on by Triumph’s triples, perhaps?) within a mere six months the drum-front-brake test mule was quickly followed by the prototypes. The two ‘missing’ machines from that batch of four suffered sad fates: a green version was never seen again after going to France, and a red one was crushed in the United States about five years ago. Of the two that remain, another one in the US was sold on eBay in 2014 for no less than $148,000, and although a £35,000-£40,000 estimate has been placed on the one coming up under the H&H gavel, who knows? Read more News and Features in March’s issue of OBM – on sale now! Next Post:Slippery Sam had nothing on this!